CHAPEL HILL — Faculty leaders at the University of North Carolina’s flagship campus recently signed a resolution supporting First Amendment rights — a move that’s positive but may have little impact on actual policy, said Laura Beltz, a spokeswoman for the Foundation for Individual Rights in Education. The Resolution on Principles for the Promotion and Protection of Free Speech was adopted Friday, April 13, by UNC-Chapel Hill’s Faculty Council. The document is based on the “Chicago statement,” a set of guidelines laid down in 2015 by the Committee on Freedom of Expression at the University of Chicago. UNC-Chapel Hill’s new free speech resolution isn’t a policy and won’t be enforceable, so “it’s hard to tell what kind of real impact that will have,” said Beltz. Nonetheless, the resolution sets a good tone for the university, she said. North Carolina is a national leader in campus free speech policies, data from FIRE shows. The research and litigation nonprofit ranks more than 450 public and private colleges each year according to First Amendment protections. Schools with restrictive policies — such as free-speech zones — receive red lights. Universities with more vaguely worded speech policies get yellow lights. Green lights go to institutions that don’t impose perceived blocks to the First Amendment. North Carolina is home to eight green-light schools, far and away the national leader, FIRE told CJ earlier this year. The state surged up the ranks in 2017 when several UNC schools overhauled policies choking speech. UNC-Chapel Hill, a green-light school since 2016, is one of 36 other institutions to embrace the Chicago statement. Winston-Salem State University, one of UNC’s Historically Black Colleges and Universities, adopted a similar resolution in 2015. A handful of North Carolina lawmakers are outspoken supporters of free speech. 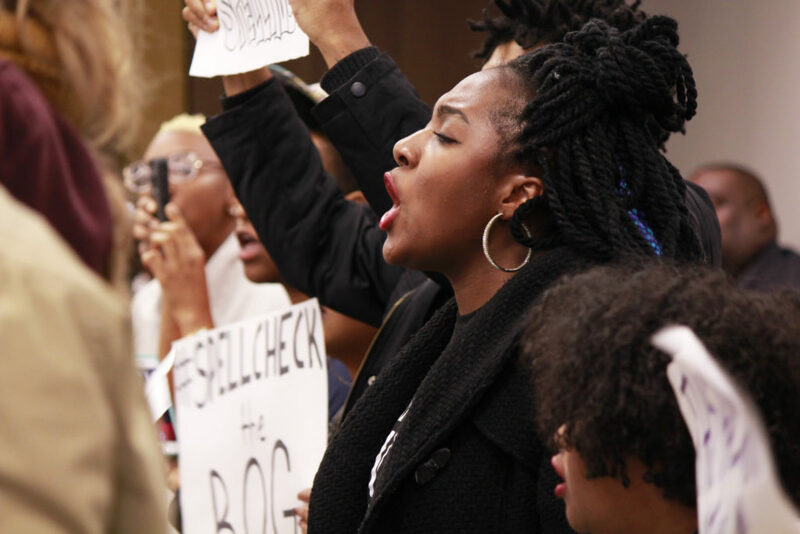 The legislature in 2017 passed a bill to fortify First Amendment rights on UNC campuses. House Bill 527, Restore/Preserve Campus Free Speech, required the UNC Board of Governors to adopt a uniform speech policy for the university system. It also directed the board to form a Committee on Free Expression. The board adopted such a policy late last year. While the UNC system publicly supports free speech now, that backing could dissolve as leadership shifts, Beltz said. That’s where a faculty resolution could be helpful.